1) Research and planning: Workout who is attending before and do your research on them. Work out who you do and do not want to talk to. Know the stall numbers and room locations of the businesses you want to meet. Do not waste time searching for business stalls. Time wasted is networking chances lost. Plan a schedule for your day so that you can be sure you manage to talk to everyone you need and want to. 2) Business cards: Be sure to bring business cards and to exchange a lot of business cards. Label the cards you receive “lead”, “partner” or “competitor” and make a note of the people you specifically want to contact once you get home. 3) Comfortable shoes: I wore a pedometer (a step counter) at the last business fair we were at and found I walked over 10km throughout the day. Therefore comfy shoes and blisters plasters are absolutely essential. 4) Breaks: Take lots of energy conserving breaks and eat lots of high energy snacks to ensure that you can absorb all the information you are given and to make sure you last till the end of the fair. Often there are free networking drinks or sessions after a business fair which may be a great opportunity for you to meet competitors, potential clients and make essential business partnerships. 5) Handshake: A good handshake and first impression (dress wisely) is essential when you have a 3 minute meeting with a potential business customer. You want to be able to inform them about your business in a confident, well-rehearsed and informed manner (perhaps with material on your business). A potential client will meet hundreds of people throughout the day and you want them to remember you and your business as friendly and professional. 6) Freebies: DO not make the rookie error and approach a stall for a chat just for a freebie. You do not need one hundred free highlighter pens or jelly bean packets and this approach wastes vital time that is needed at a large fair to ensure you make lots of relevant business connections. 7) Seminars: Select in advance the seminars and workshops you want to go to. Remember that whilst you are sitting in a workshop vital networking opportunities are being missed. Time is essential at a business fair. Select wisely which workshops would be beneficial and use them as an opportunity to increase your knowledge whilst resting your feet. 8) Be realistic: If you do not get to speak to all the businesses you want to at the business fair than take a business card and drop them an email when you get home. The timing of this email is essential as in the days after the fair attendees will receive lots of emails. Hold off sending emails for a few days to separate yourself out from the crowd. 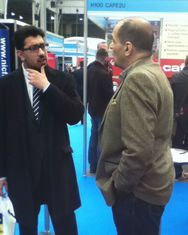 Most importantly at a business fair at a large venue like London excel or Birmingham Exhibition centre is to have fun. A smile at a fair makes you appear more approachable and energetic. Make the most of a day out of the office and the opportunity to meet lots of dynamic, interesting people. Enjoy it!